NOTE: Orders placed after 12 Noon PST Friday, or during Saturday or Sunday, will be shipped out the following Monday. Orders shipped out Friday, will not be delivered until the following Monday as UPS does not have Saturday deliveries to most territories. The FlashPro allows full user tuning and datalogging of drive by wire S2000s. It includes Windows based software called FlashProManager. 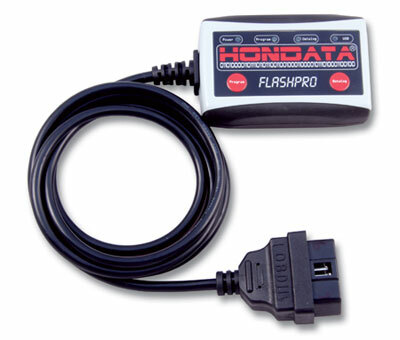 The FlashPro connects from your laptop's USB port to your vehicles diagnostic port to provide 90 second programming with a variety of calibrations with extensive real time and stored datalogging capabilities. - Expanded fuel, ignition & cam angle tables for forced induction. - 4 bar MAP sensor support (40 psi). - Fully programmable module with wheel speed sensor inputs and adjustable output to ECU. - Works with inductive, active and hall effect sensors. - On the fly adjustable target wheel slip. - Twenty seconds of high resolution on board datalogging memory for setup and diagnostics. - Wheel speed sensor error logging. - Settings for target slip while cornering. - PID control of output. - Owner registration and password protection for security. - Serial and CAN outputs for future expansion.